Dhaba offers healthier alternatives to Indian dishes. 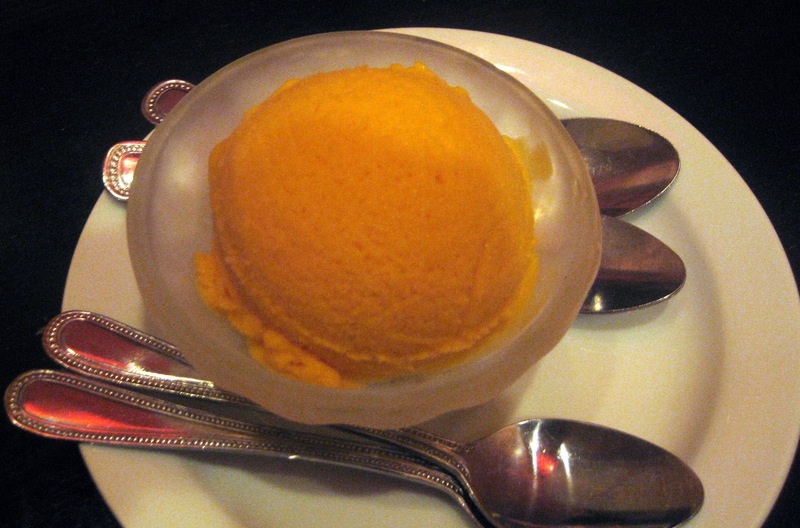 With no cream, butter, or ghee, the restaurant serves up Indian fare which, while not authentic, offer its own unique strengths. 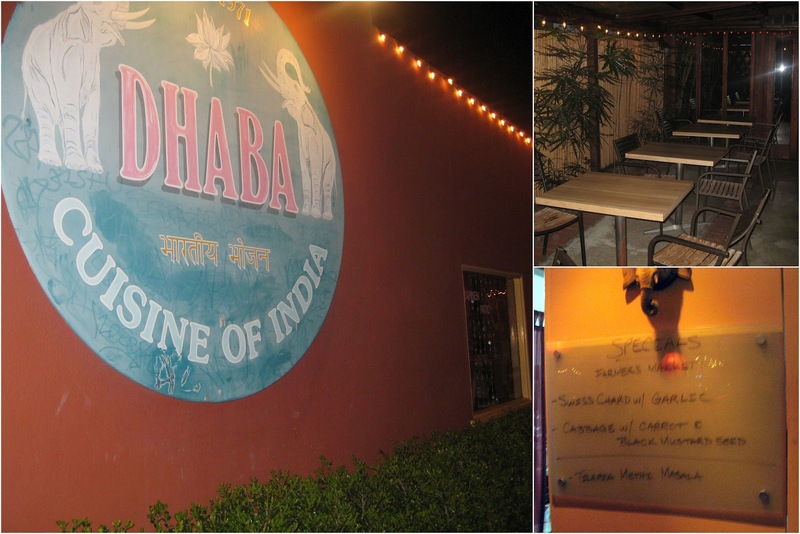 Dhaba isn't an Indian restaurant for Indians. And that's not a bad thing. It may even be brilliant. It's Indian food for Californians. Which, yes, of course, includes plenty of Indians/Indian-Americans like myself, and as long as you don't expect the dishes to be authentic renditions of the ones on the subcontinent, you'll leave satisfied. 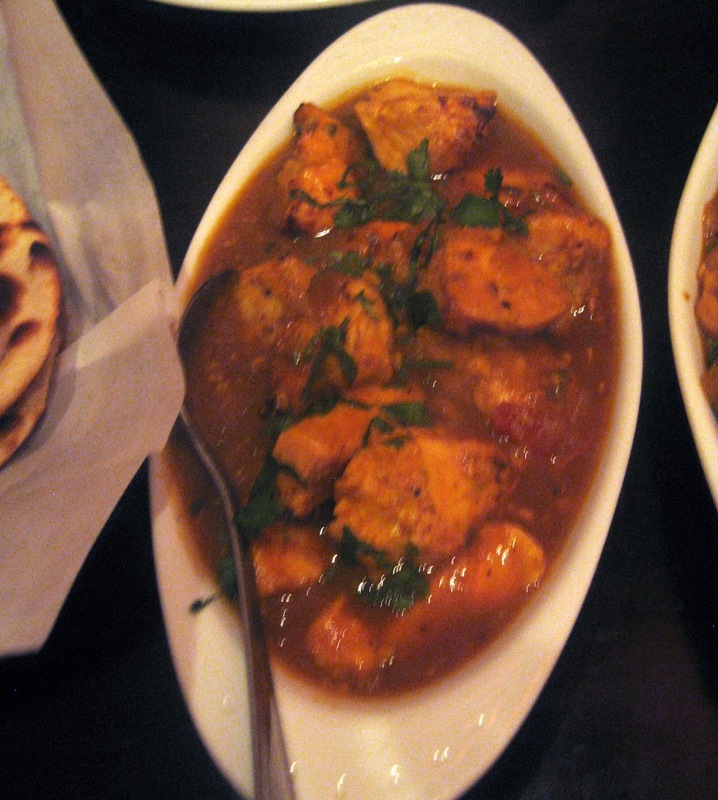 Dhaba's dishes are lighter and healthier than their authentic counterparts. There's no ghee, butter, or cream to be found (with the sole exception of the Vegetable Korma, which contains cream). It even has hummus on the menu (not Indian, but a healthy appetizer that works well with Indian cuisine). It's been open and in the same location for 40 years in Santa Monica. Impressive. The peach color scheme includes draped fabrics and wall hangings. There's a cute outdoor patio area too. On this Saturday night, we -- Nick, plus our friends Shalini and Puran -- worried it might be too cold though, so we sat inside. It soon became packed inside. This despite the fact that there are many other restaurants located on the same street. There's one aspect of the food that I absolutely love: the restaurant's daily specials come directly from the farmers' market. In general, at many restaurants I avoid the specials, because I have this fear (occasionally justified) that the reason something is so "special" is because it's about to go bad. But here, I'd encourage you to order whatever is on special. This farmers' market fresh quality extends to many of the dishes. What I don't like is that what is lost with the ghee, butter, and cream isn't necessarily made up in other ways. 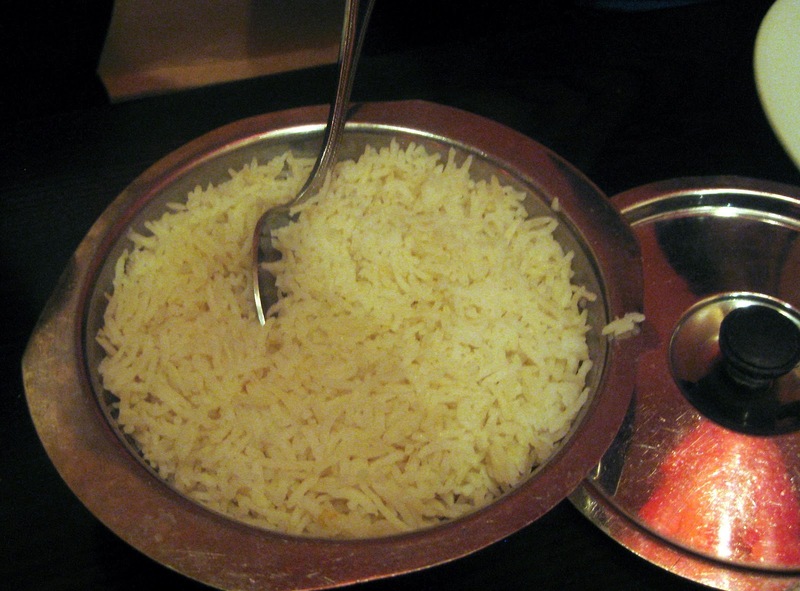 Several of the dishes tasted bland or just plain boring. 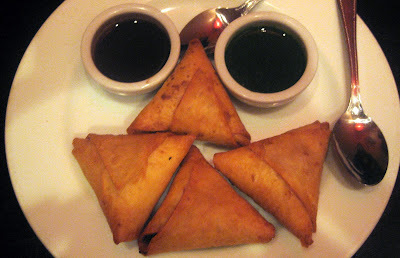 The Samosas are a solid middle-of-the-road size and feature a crispy outer layer, but we all agreed that the samosas simply aren't flavored correctly (at least, not authentically, and there's no unhealthy ingredients involved in doing that). None of us liked these. I simply had to know what Chicken Tikka Masala tastes like without cream. It's a noble effort and, to be honest, the masala itself (where the cream typically resides) isn't bad. The problem I had is with the chicken itself. It was tough. My suspicion is the restaurant used breast meat, not a good substitute for tender thighs. Breast meat also doesn't offer the flavor that chicken thighs typically lend to a dish. 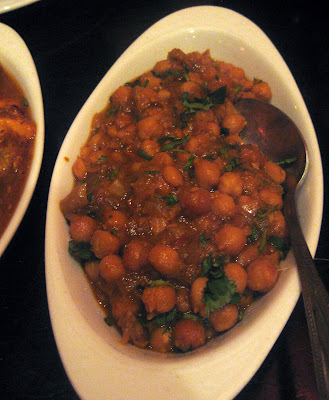 The Channa Masala, chickpeas in a tomato and onion curry with ginger, was terrific. The cilantro tasted so fresh it was like I was tasting cilantro for the first time. I kept taking seconds and thirds of this dish, until I finally finished it off. 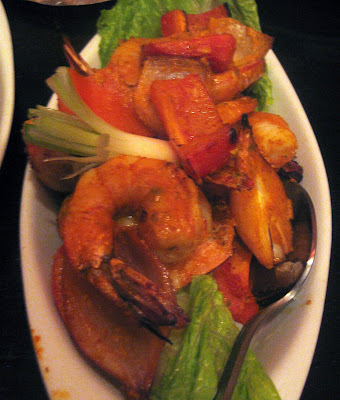 The Tandoori Shrimp are also well done. In addition to the shrimp being well flavored, the bell peppers served with it were flavored as well. I thought the seasoning was a bit heavy on the salt, but no one else did. The shrimps were large, which I liked. I hate ordering a shrimp dish then playing "Where's Waldo?" with the shrimp. 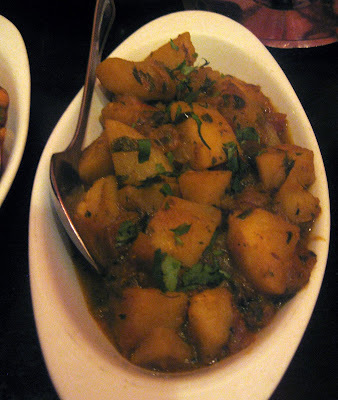 The Aloo Methi is flavored well. I thought including some seeds (fennel, etc.) in the presentation would have made it better. We ordered Basmati Rice, which is $3. Other options here include Brown Rice ($3), Vegetable Biryani ($6), Chicken Biryani ($8), and Lamb Biryani ($10). We also ordered some Plain Naan. 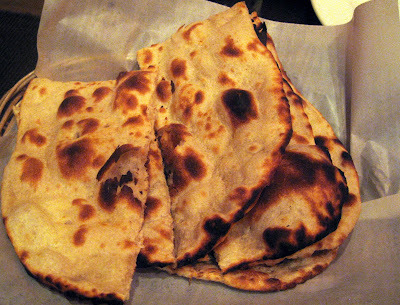 The restaurant also offers onion naan and garlic naan, plus roti. 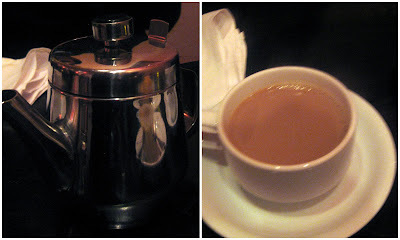 Shalini ordered Chai. It comes out in a cute little kettle, which you then pour into your teacup. At first, Shalini was concerned that it didn't come with any sugar or milk, but after tasting it, she said it was already perfectly flavored. The restaurant hand makes several ice creams, and Nick and I opted for the mango. It's great. I'm just now thinking that I should have asked the server if cream is used in the ice cream cause I'm not sure how that works otherwise. I'd go to Dhaba again, but not if I have a craving for Indian food. I'd go if I'm looking for something light and then stick with dishes whose recipes don't originally call for cream or much butter anyway. Dhaba Cuisine of India, 2104 Main St. Santa Monica 90405. (310) 399-9452. Join saagAHH on Twitter and Facebook !